... last night's TSGS meeting. 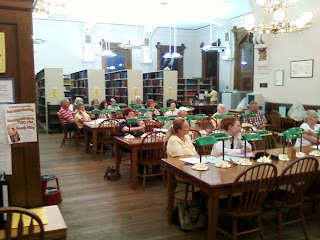 We had about 20-25 attend our meeting! We are trying to get more of our 425 members to attend, with a slight increase noted over some meetings of our last fiscal year of 15-20 attending. We would love to have more members & guests to come join us. 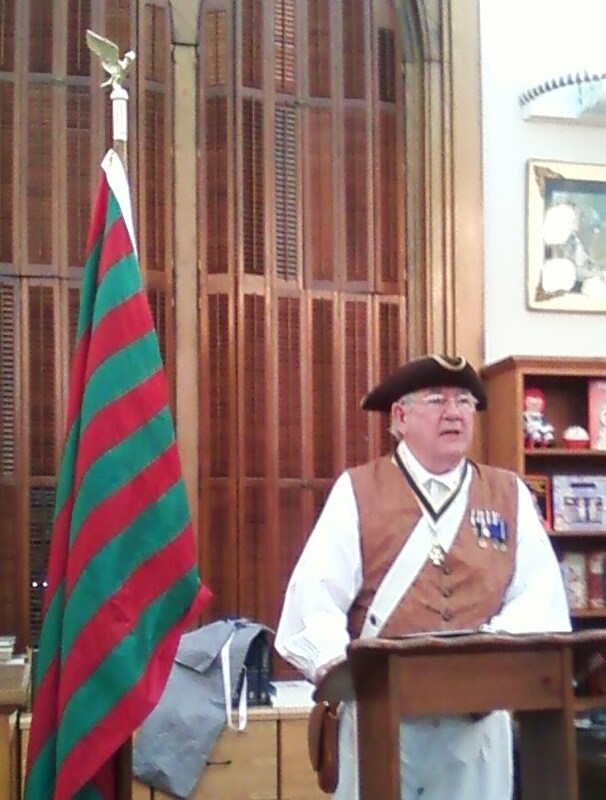 Our guest soeaker was Ken Gilkey, Presideent of the Ohio Valley Chapter of the Sons of the American Revolution. Ken gave an interesting account of George Rogers Clark capture of Ft. Sackville (Vincennes, IN). The after meeting comments were very good. Thanks, Ken! The red & green 13 striped flag is known as the George Rogers Clark flag. Colonel Clark was a brother to William Clark of the Lewis & Clark Expedition. After cleaning the small G.A.R. sawhorse type stand, I showed it to our members to see if anyone knew why these were at Oak Hill Cemetery. This one was on loan to show. Everyone that gave a comment suggested this plus the other 8 or so others were used to set a coffin upon at the cemetery before it was moved to lower the coffin into the grave. (They may have been, also, used in the homes or other places where the body of the deceased may have been on display before going to the cemetery.) All agreed that it was interesting that these existed. 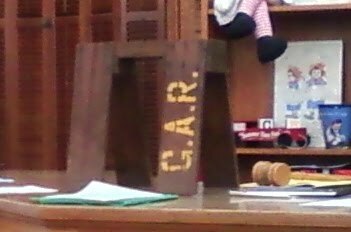 "G.A.R." was determined to stand for the Grand Army of the Republic. We had a very good meeting that many missed... next month's meeting will feature Robert N. Hall a very entertaining speaker who will discuss the works of author Washington Irving including Rip VanWinkle and the "Legend of Sleepy Hollow" (kind of a fall/Halloween theme). Mr. Hall will be dressed as Ichabod Crane! I have heard this and about 5 other programs by Bob and I believe this is his very best of the great programs I have had the opportunity & pleasure to hear!